The Palmer LTER has very specific areas that they study. This is to make sure that the data that is collected aligns with a grid system year after year. This helps making the data analysis more consistent and meaningful over time. This grid system starts at Palmer Station and works south along the Western Antarctic Peninsula (WAP). 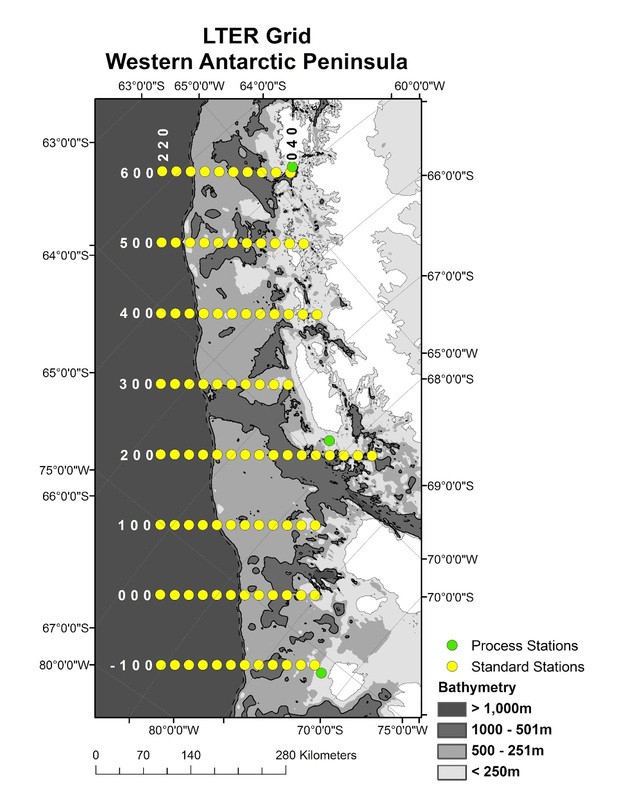 Palmer LTER scientists take all kinds of samples along a predetermined set of the yellow stations as shown in the grid. We started at Palmer (green dot at the top of the grid), but we have since traveled to about the 200 line which is about half way down near the second green dot. Can you find it? 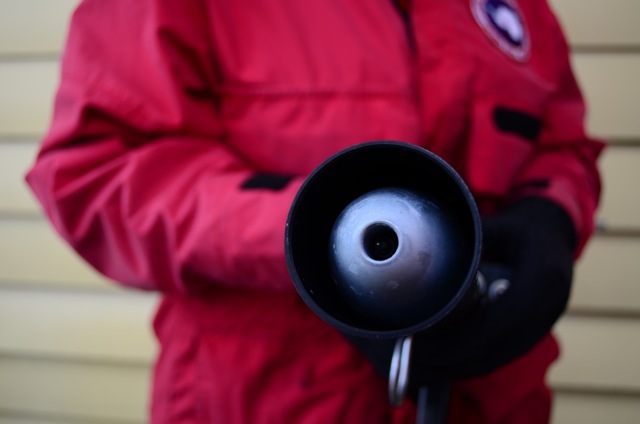 The LMG is outfitted with instruments that collect information on air and water temperatures, salinity, and depth while we sail. Those are combined with the latitude and longitude of the ship. Together those generate a profile or picture of the water that we are traveling over at that particular time. 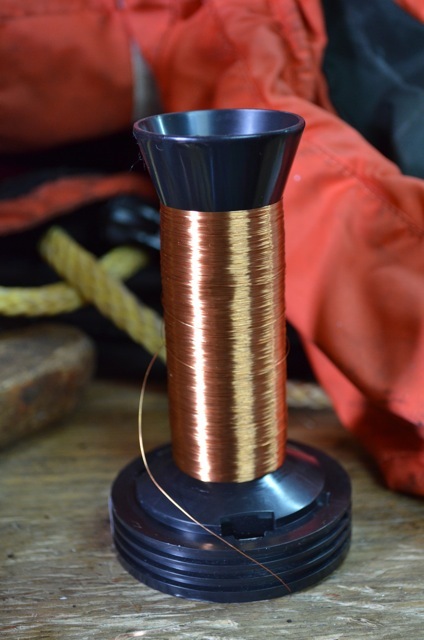 A thin copper wire connects the probe to a recording system that transmits the data in real time back to the ship the moment the probe hits the water. When the probe reaches its rated depth (which is a function of how fast the ship is traveling and the amount of wire contained within the spool) the profile is complete and the system is ready for another launch. 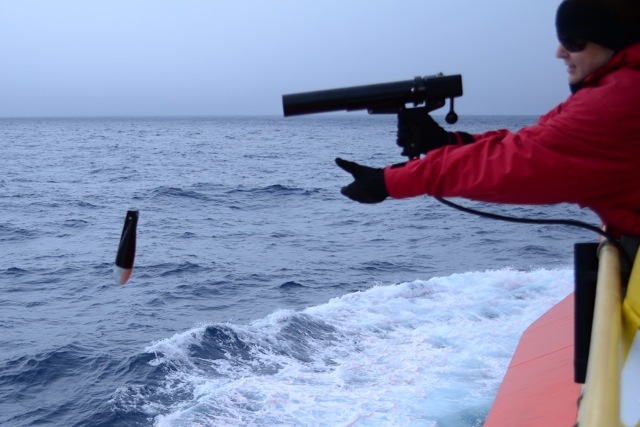 Launching these XBTs helps scientists generate better profiles of the ocean currents and how they combine over a particular area. 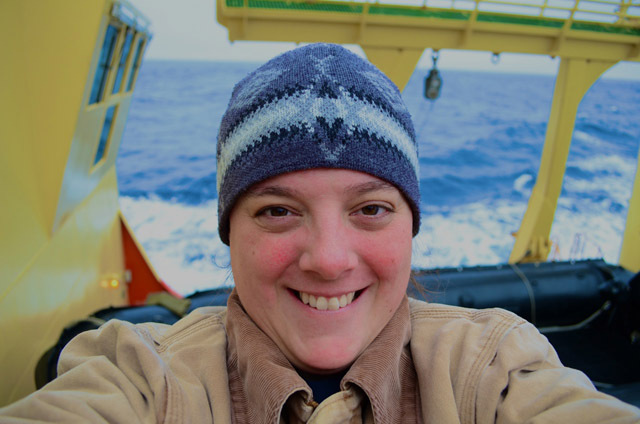 They also track how temperatures change over parts of the ocean. On this particular shift I was assigned to launch these while we were crossing the Drake. Over the course of crossing the Passage, we deployed 70 XBT probes around the clock for two days. Everyone on the ship took a shift. We worked in four-hour shifts to make sure the probes were dropped in the water every 30-35 minutes. That meant some people were up in the middle of the night! Luckily, my shift was from 8am to noon. So, I got to sleep at a normal hour. Thank goodness because we've put in some pretty crazy hours these last few days. Data from the XBT. Temperature is on the x-axis and depth of water is on the y-axis. 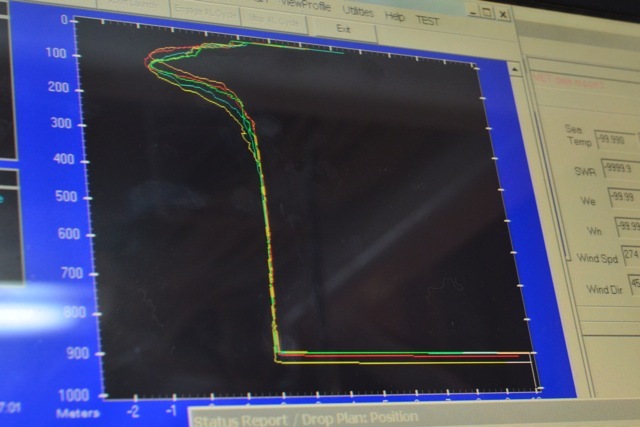 Here is a water profile on the computer screen on-board the ship after the XBT probe is finished with its descent. Can you see what depth it stopped taking measurements?